The Le Chamois Hotel has the best location on Blackcomb, literally at the base of the lifts. You cannot get any closer to the action than Le Chamois. Wander downstairs in the morning, pick up your skis and walk 50 yards to the bottom of the high-speed Wizard chair. In the afternoon you can ski back right to the front door. Unit 504 is an executive duplex which has just completed a total renovation. Offering 3 bedrooms and a loft, it sleeps up to 8 people in great comfort and style. Decorated in a modern idiom, but with warm autumnal Whistler colours, it is an extremely elegant and spacious apartment on 2 levels. The main level features a large reception area with gas fireplace and extensive comfortable seating, a spacious dining area with antique table and an ultra-modern kitchen with stainless steel appliances and granite countertops. On the same level is the master bedroom with a king or 2 twin beds, plus luxury ensuite bathroom; upstairs are the second and third bedrooms, each with king beds and the small loft bedroom (with no exterior window but an opening onto the staircase), which has a queen bed. 2 bathrooms plus a powder room complete the accommodation. Everything in this apartment is in immaculate condition and perfect taste. The Le Chamois hotel also has full hotel facilities onsite, including a heated swimming pool and exercise room. 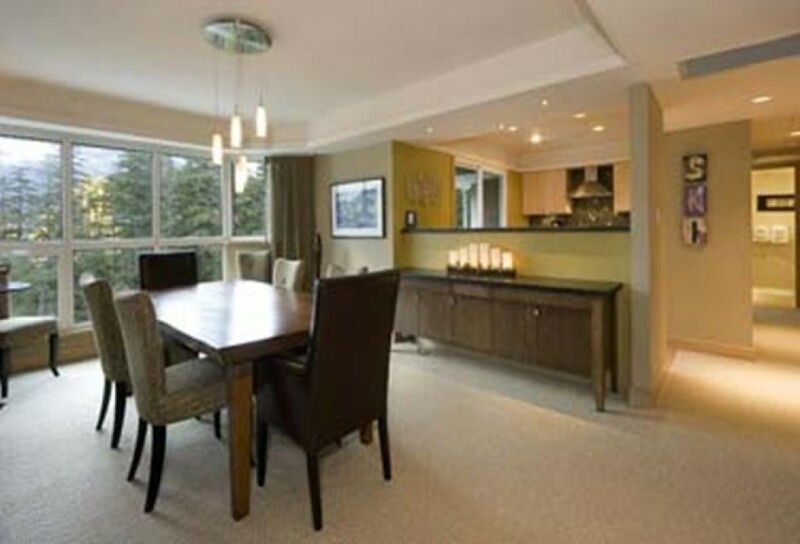 This is an excellent venue for a Whistler trip where convenience is the watchword.